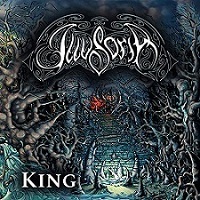 ILLUSORIA is a Mainz based Symphonic and Melodic Power Metal band, releasing their second album here titled “King,” which contains nine tracks. Formed in 2012 and this is the first album since 2013’s ‘’Illusory World’’. I didn’t know they were from Germany in a sense, I noticed that Eva Kreuzer had a bit of a Doro Pesch raw energy about her and I thought she was very reminiscent of the Heavy Metal Legend that is Doro. They blend a lot of different styles persay, they aren’t the prototypical Power Metal band, they fuse the symphonic elements of bands like WITHIN TEMPTATION and EPICA while adding a bit of Thrash Metal and Orchestral arrangements that are very reminiscent of TRANS-SIBERIAN ORCHESTRA. They don’t have the budget of TSO but they definitely have that classical metal vibe coming through. The production of the album is really top notch for such a new and small band and I was pleasantly surprised. The opening instrumental is only about 20 seconds long but it sounds like a ton of bricks, hell, I would have loved a longer instrumental. Just loved the beginning of the album and the sound is so rich. First of all, they have some layered Death Metal backing vocals here and there, especially on the 2nd and 3rd song, I felt it was unnecessary and kinda killed the flow of the songs. Just backing vocals would have been enough and they seemed to try way too hard to get that WITHIN TEMPTATION sound and it felt forced. The worst example of this is on ‘’Caught in Time’’, though this time it’s not the backing vocals that are annoying but the first part of the song consists of Falko Schulze trying to be a Death/Black Metal Singer and failing mercifully. It’s just awful and just kills the song for me. Thankfully Eva takes the lead afterwards but for me the song was dead in the water because it just didn’t fit well at all. They don’t need any harsh vocals at all, I felt the band had a lot of potential but some songs were ruined by horrible harsh vocals. It’s kind of weird because on ‘’The Crucible of Man’’, they actually mesh both styles and it’s probably their best effort to fuse the harsher vocals with the smooth sounds of Symphonic Metal and Eva’s beautiful voice. It’s the polar opposite of the preceding song. They don’t try too much to have the Operatic feel on many bands in the watered down style that is Symphonic Metal. All the bands have been trying to be like NIGHTWISH since 1998 and thankfully they don’t rely too much on trying too hard to sound like them. Yes, on a couple of songs, Eva Kreuzer belts out her best Maria Callas but it’s not overdone and they definitely deserve a lot of credit. If you like bands like AFTER FOREVER, XANDRIA and DELAIN , you will probably like this band very much. After listening to the album, I am going to listen to their first album and see the progression of the band since then and they are a band with a bright future. They have to find that balance of different types of vocalists but they are a young band and they will figure it out so they can perfect their style nonetheless. A Solid Effort!